Two former DUP special advisers (Spads) have disputed events at a meeting in which it was claimed one told the other that cost controls would not be introduced to the RHI scheme. Timothy Cairns alleged the DUP's most senior official, Timothy Johnston, made the comment. Mr Johnston said he did not give the instruction at the June 2015 meeting. Mr Cairns was Jonathan Bell's Spad at the enterprise department when applications to the scheme spiralled. He is giving two days of evidence to the Renewable Heat Incentive (RHI) inquiry, which was set up to investigate what went wrong with the flawed energy scheme. The inquiry heard the meeting was held on 26 June 2015, to "clear the air" between Mr Cairns and Mr Bell, after the pair had a major row in London. After that item was addressed, Mr Cairns said the issue of RHI was raised. Mr Johnston, who is now the DUP's chief executive, has a completely contrasting account of the meeting. He claims it was also attended by the then First Minister, Peter Robinson, something Mr Cairns has rejected. Mr Cairns told the inquiry he believed that during the June meeting, Mr Johnston said tariff controls were not to be introduced. He also said he was told to work with Andrew Crawford, who had been Arlene Foster's Spad when she was enterprise minister and had an understanding of RHI, to look at an alternative. He added however, that it was only his recollection of events and he was "not going to the sword on it". Junior counsel to the inquiry, Donal Lunny, read from Mr Johnston's witness statement, which has not yet been published. He said Mr Johnston claimed RHI had not come up at the meeting: "I did not instruct or suggest at any point to Mr Cairns that tariff controls would not be introduced, the details of which I was unfamiliar with at this time." Earlier in Tuesday's hearing, Mr Cairns admitted he was prepared to go along with the party's narrative about RHI when details of the flawed scheme emerged in December 2016. Last week, Jonathan Bell claimed he had been the victim of a "smear campaign" by the DUP when he spoke out about problems with RHI. Mr Cairns told the inquiry that politics was a "grubby world". He said he was prepared to go along with the party's version of events, but denied that his involvement amounted to Mr Bell's claims of a "smear campaign". The inquiry heard Mr Cairns sent a text message to another DUP special adviser (Spad), Richard Bullick, in December 2016, saying he believed Jonathan Bell "needs to be exposed" for his behaviour as a minister", but "I can't expose my part without putting the boot into PR" (Peter Robinson). Mr Cairns provided witness statements to the RHI inquiry claiming he raised allegations of bullying from Jonathan Bell with Peter Robinson when he was first minister, but that Mr Robinson did nothing about it, and "protected" Mr Bell. Mr Cairns said he was prepared to give a statement to his party setting out his allegations against Mr Bell for use in the media. But he also believed that former party leader Peter Robinson was at fault for failing to deal with allegations against Mr Bell which had been brought to him. Mr Cairns said he wanted to be critical of Mr Robinson in his account, but he understood the party might not want that to happen. He said he was prepared to "take the party line" if that was what was required. 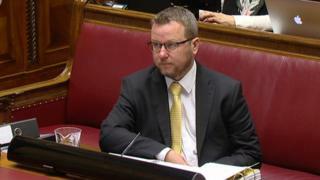 Inquiry chair Sir Patrick Coghlin said Mr Cairns was prepared to modify his account to protect Peter Robinson and that it "seems a rather unpleasant way to run a party". Mr Cairns replied that that was a question for the DUP to answer, and that he went with the party's line at the time as he "just wanted to be out of the public eye". "That's politics I'm afraid, it's a grubby world," added Mr Cairns. Sir Patrick replied that was something of "an understatement". Also on Tuesday, Mr Cairns said Timothy Johnston was "very much top of the tree" in the DUP and that there was a hierarchy of advisers in the party. He told the inquiry there was not one DUP elected representative, special adviser or employee who did not recognise Mr Johnston's power. The senior official served as special adviser to three first ministers and became the DUP's chief executive last year. Mr Cairns said Mr Johnston operated well beyond the responsibilities of an adviser and his influence was "seen from the party top to bottom". Among his jobs were dealing with staff absences and performance reviews and chairing weekly party meetings. Mr Johnston and the DUP leader, Arlene Foster, have both said in their evidence to the inquiry that there was not a "hierarchy" of special advisers. But Mrs Foster has acknowledged that the first minister's special advisers were given more weight. In his witness statements to the inquiry, Mr Cairns said that a day before Arlene Foster told the BBC that Timothy Johnston had no role in delaying RHI cost controls, she was told he had been involved. In December 2016, Arlene Foster was asked by Stephen Nolan whether Mr Johnston had any role in delaying subsidy cuts. She said he had not - but Mr Cairns claimed he told her of Mr Johnston's role the day before. He set out Mr Johnston's role in a conference call to which Mrs Foster and Mr Johnston and another DUP special adviser (Spad) Richard Bullick were all parties. In his witness statement, he said he mentioned that Mr Johnston had told him to liaise with Mrs Foster's then Spad Andrew Crawford to develop a party position on the introduction of cost controls. He also said he had conversations with Dr Crawford about the scheme as requested by Timothy Johnston, due to Dr Crawford's knowledge about RHI. The evidence also includes a text message Mr Cairns sent to another former DUP special adviser, Richard Bullick, in December 2016, about difficulties with Mr Bell. Mr Bell "cornered Ms McIlveen at the party conference and had berated her for some time until she broke down in tears", he also claimed. On Tuesday, Mr Cairns said no special adviser in the DUP had wanted to work with Mr Bell. He said he "did not wish to be Jonathan Bell's Spad" and that he felt the decision "defied logic", as he believed it was better for Dr Andrew Crawford - who had been the adviser in that department for a few years - to remain there. But Dr Crawford went with Arlene Foster when she moved from DETI to Stormont's finance department. Mr Cairns said he could not have raised any objection to the appointment. The former DUP Spad will give evidence to the RHI inquiry again on Wednesday.